The next New Moon on 29th December will fall in 7° degrees in Capricorn. This is the sign of the goat, which seeks sustenance in the rocky, arid places of the mountaintops, running free and scaling the heights of worldly ambition or spiritual aspiration, according to the individual’s level of realisation. It can be the birthplace of the Christ (the soul), or a sign of great desire and materialism and for this reason it is the sign of extremes, as it can express the best and the worst of humankind. Capricorn is an earth sign and in it we have expressed the densest point of concrete materialisation of which the human soul is capable. This means that when the crystallization of energy has reached a certain degree of density, it is easily shattered and destroyed and, due to his materialistic nature, plus the laws of karma, the individual brings about his own destruction in order to release the new life and rebuild the form. 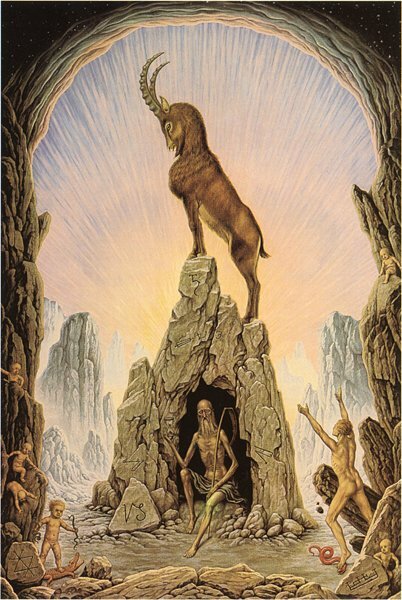 For this reason Capricorn has been defined the sign of conclusion, as the mountaintop symbolically marks the point beyond which further ascent in any particular life cycle is not possible. Esoterically it has been defined as the sign of “periodic arresting” because progress becomes impossible under the existing forms and we must first descent into the valley of pain, despair and death before attempting to scale the heights, which are representative of the inauguration of a new cycle of effort. 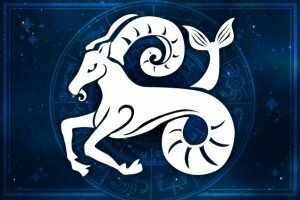 Capricorn is a royal blue sign and it is the one that opens the door into the life of the Spirit, into the life of the Kingdom of God. Royal blue is about mysticism, the Higher mind functions (clairvoyance, clairaudience, clairsentience), it is the clarity at the sense doors, intuition, sensitivity and relating. On the challenging aspect, royal blue is about addiction, loneliness, secretiveness and isolation. Capricorn rules the knees and this is symbolic of the lesson that the individual has to achieve, for only when the Capricornian subject learns to kneel in all humility and with his knees upon the rocky mountain top to offer his heart and life to the soul and to human service, he will be permitted to pass through the door of initiation and entrusted with the secrets of life. When the man born in Capricorn can kneel in spirit and in truth, he is then ready for the initiatory process upon the mountaintop. This is the star sign where we experience the inner battle of the old established order and habits and the new and higher inclinations and tendencies. Saturn, the Dweller on the Threshold and the Lord of Karma, is the orthodox and the esoteric ruler of Capricorn and his task is to force the individual to face up to the past and, in the present, prepare for the future. In this star sign the power of the Moon, which is the symbol and the ruler of the form (which represents the past) slowly wanes allowing the individual to progressively free himself from the control of matter. The New Moon will be conjunct two Fixed Stars in Capricorn: Facies and Kaus Borealis in the bow of the constellation of Sagittarius. In the Bible a bow signifies the doctrine of truth, which those who are in falsities flee from or fear, while the horseman represents those who declare the truth. 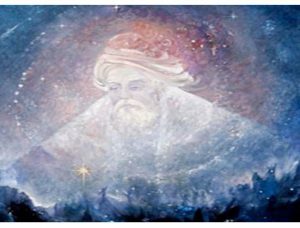 According to Vivian Robson, the Kabbalists associate Sagittarius with the Hebrew letter Vav and the Tarot card “The Lovers”. The letter Vav is about the communication between the celestial and earthly forces, it is about connection: its shape depicts a man standing on the earth with his head looking up to Heaven, holding two apparent opposites together, reminding us that there only One Truth, which is the unity of God. 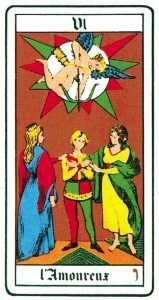 In the esoteric Tarot the card The Lovers is called L’Amoureux and it is referred to as Following the Path of the Heart. The Lover stands at a crossroad and has to choose which way to take next. The two women on either side of him represent one the instinctual worldly lower nature, the easy and passive path, and the crowned one the path of wisdom, the soul and initiation. The winged child is symbolic of love, faith and the beginning of a new life. This means that the will in him will determine his direction and the love will give him the impetus for the movement. The crossroad represents the opposition between the Divine and profane worlds. The one who chooses the path of nature lives entirely for himself and he will keep living in the mass consciousness, staying with no light of understanding, allowing the wave to carry him like a child. On the contrary, the one who chooses the path of wisdom has fallen in love with a higher demanding authority, which is the one of the Soul. In ancient Arabia Kaus Borealis was referred to as the desert bird, the ostrich. The ostrich’s feathers were a symbol of life and death as they were used by the Goddess Ma’at to weight the weight of the heart of the soul after death. As the ostrich sticks its head in the ground to hide, it also indicates that we deny, avoid something in our life, that we do not have to deceive ourselves but we have to accept the truth which is right in front of us. The New Moon, which is going to be also conjunct Vulcan and Pluto, the two planets carrying the energy of Ray 1 of Will and Power, which produces the death of denial, will be sextile Mars, Neptune and the Fixed Star Skat in Pisces. Skat is a star in the shinbone of the figure of the Water Pourer, who is said to represent Ganymede, son of Tros of Dardania, who was carried to heaven by an eagle to act as cupbearer to Jupiter. 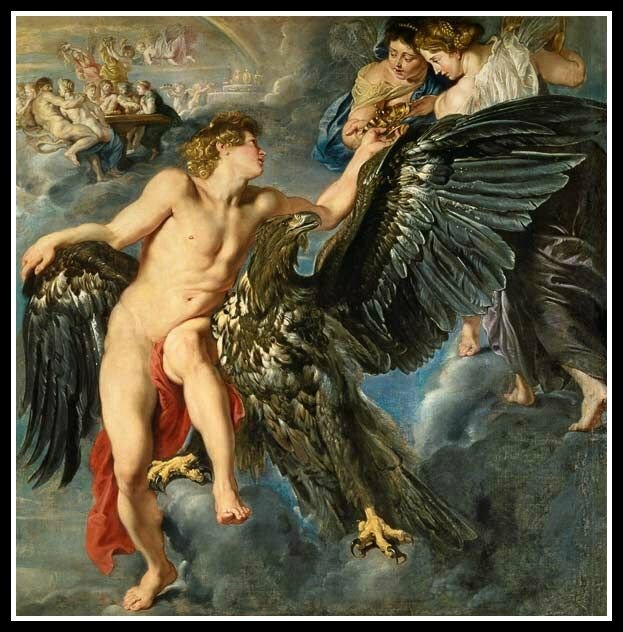 This myth symbolises the rapture of the soul for God, as the eagle is emblematic of the spiritual quest, the power to carry and materialize the vision and it represents man’s connection to the Divine, bringing a message of a renewed life. The eagle gives us the courage to go beyond our own limits and reach higher in order to become more that what we think we are: our soul. The shinbone highlights two aspects. Bones indicate death but also the underlying, enduring truth; at the same time the shinbone or tibia reminds us of the act of kneeling, which is a symbol of strength, commitment and knowledge of God. This New Moon will put us in front of the Truth, the inner truth and everything which has been kept secret within ourselves or in our relationships will come to the surface so that we may truly take the responsibility of ourselves and our lives. Time has come to listen to our own soul and let go of all the relationships that have come to an end so that we can walk along the path of our true destiny. It is a time of endings and new beginning, a time to materialize a new form in tune with the Truth and the Love that we feel within. “I am the pure Light, my son. I am not a handful of worthless dust. I am not just an empty shell. I am a regal pearl formed in this world! Close your eyes to see and become aware of me. Perceive me with eyes that see the unseen. Come into the mystery to find me.